When Peter M. Wayne, medical editor of Introduction to Tai Chi from Harvard Medical School, began conducting scientific studies on the health benefits of tai chi, he began noticing that tai chi works in a variety of ways, not just one. Whereas most drugs have a single active ingredient, he observed that tai chi was more like a multidrug combination that uses different components to produce a variety of effects. Wayne formulated the idea of the "eight active ingredients" of tai chi, which he and his colleagues now use as a conceptual framework to help evaluate the clinical benefits of tai chi, explore the underlying mechanisms that produce these effects, and shape the way tai chi is taught to participants in clinical trials (and to teachers). While different styles of tai chi emphasize different ingredients, these therapeutic factors are interwoven and synergistic. Here's a summary of one of the active ingredients of tai chi. Structural integration. Tai chi looks at the body as an interconnected system, not as a collection of individual parts. As a result, when practicing tai chi, you won't do one exercise for your biceps and another for your glutes. Instead, tai chi integrates the upper body with the lower body, the right side with the left side, and the extremities with the core. Alignment and posture are part of this structural integration, and tai chi trains you to find alignments that are safe and unstrained, allowing you to perform graceful movements. You move more efficiently—not just during your tai chi practice, but throughout your day. The result is less stress and load on your joints and better balance. 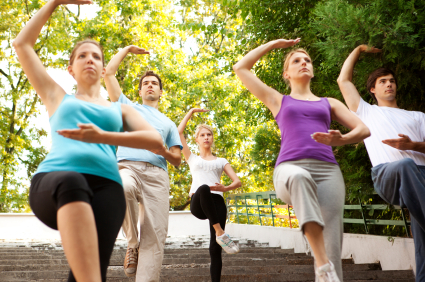 Improved posture provides tai chi benefits that extend well beyond your class. When you walk or sit with your shoulders rounded and your torso hunched over, it is hard to take deep breaths. But when you straighten your back, roll your shoulders back and down, and open your chest, you breathe more deeply and efficiently. Not only does this integration improve your ability to move without pain, but it also affects your mental health. In two different studies, people who sat or walked more upright during the experiments had a more positive outlook afterward than those who slouched while sitting or walking. To learn more about tai chi, its health benefits, and how to learn its movements, check out Introduction to Tai Chi from Harvard Medical School.